Pipette.com has announced their current disposable transfer pipette promotion, specifically Heathrow disposable transfer pipettes. Labs seeking high quality and affordable disposable transfer pipettes will greatly benefit from this promotion. Heathrow Scientific is a leading manufacturer of high quality lab supplies and instruments. A disposable transfer pipette is ideal for a variety of scientific applications including blood banking, urinalysis, hematology, wet chemistry, microbiology, and serology. Their disposable transfer pipette is catered towards labs in need of affordable and dependable plastic ware. Disposable transfer pipettes are manufactured in one-piece and made of unbreakable polyethylene. There is no bulb to insert or remove and they come in a variety of sizes including 0.5 mL, 1 mL, 2 mL, and 3 mL. A disposable transfer pipette is the ideal substitute to a glass pipette since it minimizes the hazard of broken pipettes. Disposable transfer pipettes are designed to make scientific experiments quick and easy. Furthermore, they are available in packs of 500 pieces and sold per pack, sterile or non-sterile for the customers’ specific need. Disposable transfer pipette promotion: Buy 1 pack of Heathrow Disposable Transfer Pipette and Get 1 FREE pack. Use promo code “Transfer1” at checkout. 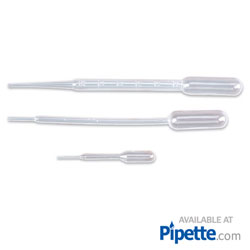 Pipette.com is a major provider of pipettes, tips, lab equipment, and calibration service for the life science community. With over 17 years of expertise, Pipette.com continuous to deliver excellent customer service and catered solutions for the life science community. Their online portfolio includes 20+ major brands of pipettes, 10+brands of tips, lab equipment, and ISO 17025 calibration service. Questions, concerns and other inquiries can be addressed to the company directly.